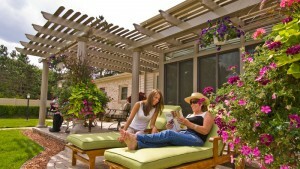 U.S. Patio Systems and Home Remodeling is an authorized TEMO pergola dealer serving St. Paul, Minnesota, and communities throughout the Twin Cities region. TEMO pergolas bring a touch of elegance to outdoor spaces and come outfitted with a variety of spectacular features. When a basic wood pergola just won’t do, the heavy-duty extruded aluminum pergolas from TEMO meld the beauty of a traditional shade structure with the long-lasting durability of electrostatically finished support columns and latticework. If you think that you might want to add a TEMO pergola to your outdoor living space, please contact U.S. Patio Systems and Home Remodeling today. We are an authorized TEMO dealer for pergolas, sunrooms, screen porches, patio covers, and other indoor/outdoor living structures. U.S. Patio Systems and Home Remodeling is a leisure space specialization company that is committed to providing every customer the very best service possible. We use high quality products from reputable manufacturers (like TEMO), hire the best people, and back our installations with one of the best warranties in the home improvement business.